We’ll be straight on this: we were skeptical of these wheels at first. If you know the history of the Kryptonics line, you know all about how these wheels (especially the red C-65) literally changed skateboarding for everyone. 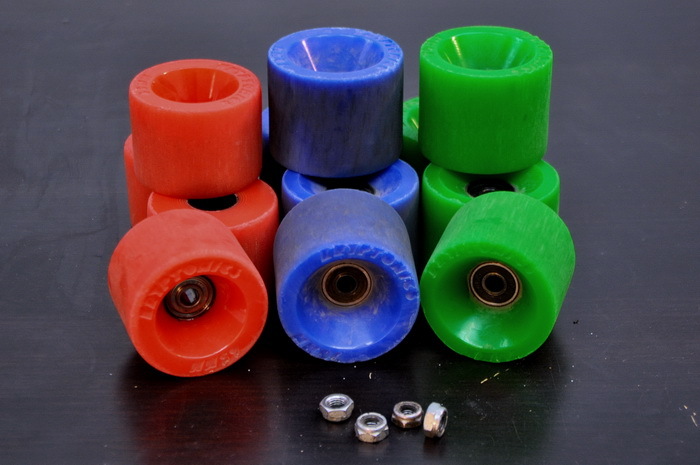 Other brands can lay claim to “first urethane” or “first sealed bearing” or particular shapes that continue on to this day, but it’s certain that Kryptonics were the first true, “uber-thane” that was so much faster, grippier and durable than everything else that the industry scrambled to catch up. Add to this that the C-Series shapes and offsets you see here became the basis for generations of wheels that are still ripping it and you start to get the picture. The picture, however, also includes the sale of the company, division of the assets and designs and a fairly long list of sub-standard wheels, discount store boards and just plain whack stuff bearing the Kryptonics name. So, when we heard that the crew at Dwindle had purchased naming rights for “high-end wheels”, we weren’t sure what to expect. We had some contact from fairly credible skaters involved with the production and we were impressed to see that someone searched out original molds and shapes for the C-Series Kryptonics (which they’re calling by the older “Star*Trac” name, but we see as the C-shape and logo), but we had to weigh this against what seemed to be a likelihood that the wheels would be poured in cheap ‘thane and intended for price-point beginner boards. Things began to change for us when the box arrived, however: these new Kryptonics Star*Tracs have the immediate “hand feel” of a good wheel. The urethane is high-rebound, cleanly-poured and tacky-feeling –none of that cheap “pvc feel” of wheels you find in cellophaned boards on the shelves in discount sports store. They look good, too. Seriously, this is “the” Krypto of all Kryptos to anyone with skating experience in the 1,900’s (ha ha ha, you oldsters, that’s a different century!). These new reds are poured in the same 78a, high rebound durometer that led to 78a being the most common road (and, eventually longboard) duro for skaters, and they’re poured in exactly the right color. True to Kryptonics’ tradition, their duros follow an ascending color-code of red, blue, green, and so these are red. They’re fast, grippy, smooth and, in the 65mm size, perfect for carving and ripping across town on a skateboard of any style. The 65mm Kryptos are side-set, flat-back and with a 45mm wide contact patch. Stand-up sliders referred to the red 65’s as “a control wheel” –easy to break out into a slide but with a high degree of feel and control. “These feel light under my feet, and are easy to manipulate into either a pendy or 180.” The reds can be a little chattery for lighter riders, however, and those riders couldn’t get them to lay down lines on the asphalt. After our photo sessions, we had to hunt down a set of the red Kryptonics in 70mm, which uses an offset bearing seat and 50mm wide contact patch, and found them to be just plain fantastic “all-arounder” wheels. They’re fast, easier to kick-out than a wider, square-edged wheel and really fun in parking garages. We hear there’s a 75mm version coming, and we want them! In the old days, “the blues” were 86a and really, really good on wooden quarter pipe ramps. These reissues are 82a and are really, really good wheels for free-riders looking for a “duzitall”. They roll faster on smooth stuff than the reds, break out into slides more easily and yet offer tons of control. The blues were extremely popular with our lighter freestyle sliders. Ours were the 70mm, offset versions and we found the “narrowish” 50mm contact patch and urethane begat a “faster feel” than 70mm, 82-84a wheels the crew was swapping off their boards to skate the Kryptos. Our lighter thrashers seemed to prefer the blue Star*Tracs above the other two duros, but two elements of our crew rated them below either the red or greens in terms of preference. First come the OG dudes who were looking for the high-rebound 86a blues they remembered, “these don’t feel like a perfect blue Krypto”. Well, sure: four durometer points this low in the range is a big difference and those guys turned out to love the greenies, discussed below. Then come the more aggressive sliders, who also prefer the salad-colored wheels. Finally, the retro-guys and dedicated cruisers looking for either a period-correct wheel or the classic soft, fast ride just prefer the reds. We can’t fault that. A quick look at dimensions. We didn’t skate the blues in the smaller size, but if there were a wheel we could spec on 28-32” boards that skaters build-out to skate to school, including popsicle-stick “cruiser conversions”, we’d put the 65mm blues or the new 60mm versions on boards like that all day long. Ironically, these blues are just a softer version of the “mama bear’s porridge”, middle-ground blue Kryptonics of yore: a great wheel for skaters seeking either something a little harder or softer than the other two or who just can’t make up their dang mind. So, we get to the “hard one” and it turns out to be the most popular of the new Star*Tracs among our test crews. Exclaiming, “(t)hese are like sliding on steroids!” one of our skaters was met by cheers of agreement. “It’s like they’re pulling me into the slide, but I have total control!”, says another. In fact, this particular session marked our smooth road with long ‘thane lines and led to a concerted effort to core the wheels the following day on the epic Black’s Beach descent… because the green Kryptonics are fast, carry speed well and combine “perfect grip” with apparent durability. We never cored ‘em though: Black’s rough surface claimed another set of flat spot victims! The greenies weren’t without supporters among the “more experienced” skaters… two of whom reported the originals had been on their first skateboards. The old fellas commented that these new 86a Star*Tracs seem faster than their old ones, and they should be on the street: they’re softer. They were also really fun wheels on a ten-foot, plywood quarter pipe one of our guys found in an alley in Santee, albeit a bit large at 70mm. However, we found the new greens to be too soft in the skate park, not at all what the original green 91a’s were on polished concrete, aside from being “too damn big for vert”. Our overall feeling is that these wheels are the best thing to happen to Kryptonics in twenty years. They’re fast, well-made and with an MSRP around $45 bucks a set, make for a killer deal on great wheels. We do have some issue with the bearing spacing…set at an actual 10mm rather than industry-standard .400”, but we’ll look past that because as the inimitable Peter Verdone would point out, .400” spacers, Biltins, Tektons or Zealous bearings will preload in these wheels nicely, so it all works out. In the time since we took the photos for this review, we’ve shredded four more sets of greens and blues and moved a set of the amazing, stoke-inspiring red Kryptonics Star*Tracs into permanent status on our 1978 TeamRider. If you’re looking for a set of wheels to shred spring into summer, you can’t go wrong with the new Kryptos.